So you want to disable DirectWrite font rendering system on Google Chrome. In version 37 of Chrome the fonts looks blurry and it looks zoomed in. In the previous of Google Chrome (i.e., 37), the fonts and text looks blurry and blurred and they come up with the solution and now the fonts looks sharp again. 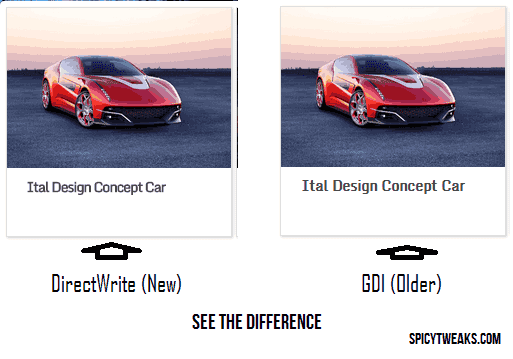 In the 37 and latest version the font rendering have been changed from GDI to DirectWrite. Most of the users who faced the issue was found to have DPI scaling to 125% instead of default value (i.e., 100%). It can be solved by changing the scaling back to 100%. If you're still facing problem in text rendering than update your Browser to version 38. On the previous version of Google Chrome, the issue can be solved by following the instructions given below. Solution: Update to Chrome Version 38. If you didn't like the font on this version of Chrome and if you would like to switch to older font rendering system than follow the following steps. Note: If you're looking for a way to solve zooming and blurred font issue than it can be solved by upgrading your browser to the most recent one and if you have already updated and you just like to disable the new font styling than follow this tutorial to get back to the previous text and font style. #1 You will need to disable the Direct Write feature using the Flags. Read below to know how to disable it. By this way you can Enable Secret Profile Manager in Chrome. Open Google Chrome and type chrome://flags in the URL bar and hit enter to load. Now look for the title that says Disable DirectWrite. If you can't find it than type chrome://flags/#disable-direct-write in the URL bar and press enter button. Click on Enable button to disable it. To make the changes to take affect click on Restart now to restart Google Chrome. Browse any website and enjoy previous font rendering. Anyway, I like the new DirectWrite font rendering system on Google Chrome running on Windows 7. The fonts look much better than the previous version. Feel free to drop a comment below if you need any help. the rightside, Modify... enter any thing between 150 and 190 hexadecimal. These changes will take effect on all browsers. We can use these settings to adjust the brightness and darkness of the fonts according to our need. Anyway, the latest version don't have any issues, we can disable DirectWrite function (as long as it is not removed by developers) (but I think it is much better than previous). We can always use Windows settings to adjust fonts and its settings (as you said above).